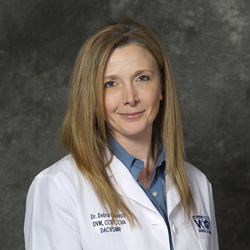 Dr. Debra Canapp’s exclusive area of interest, clinical work, lecturing, and research has revolved around sports medicine and rehabilitation therapy, specifically canine sports-related injury, sport rehabilitation, and performance. She has completed advanced courses in canine rehabilitation, hydrotherapy, acupuncture, sports medicine, orthopedics, and stem cell therapy. Currently Dr. Canapp practices sports medicine, acupuncture, musculoskeletal ultrasound, and rehabilitation at Veterinary Orthopedic & Sports Medicine Group in Annapolis Junction, Maryland. Dr. Canapp is active in teaching rehabilitation medicine, musculoskeletal ultrasound, and regenerative medicine to visiting veterinary students, rehabilitation therapy certification candidates, and veterinarians. Dr. Canapp’s current primary area of interest and research is small animal musculoskeletal ultrasound, and defining specific pathology and treatment options. Dr. Canapp currently also serves as the co-principal and medical director at Veterinary Orthopedic & Sports Medicine Group.